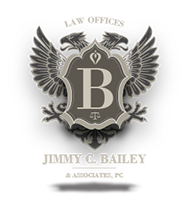 The Law Offices of Jimmy C Bailey & Associates, P.C. is dedicated to providing the highest quality professional skills, abilities and personal representation for each client and their families. At Jimmy C. Bailey & Associates, P.C. we represent those injured from personal injury and aggressively investigate and pursue claims for catastrophic injuries and death. The firm has achieved substantial verdicts and out of court settlements providing the best results possible for each injured clients and their families throughout Texas in cases which involved trucking, automobile, construction, defective products, medical malpractice, auto pedestrian, non-subscribers worker’s compensation, oil field accidents and premises liability accidents.